I've been thinking about getting back into scrapbooking again for awhile now. However I really love how digital books look, all bound like a regular coffee table book, but I hadn't yet "grabbed the bull by the horns" and gotten started. So it couldn't have been better timing when I was contacted recently by a fab company called My Memories to host a review and give-away of their software here on my blog! I've been playing around with their software for about a week now and - WOW! The possibilities are endless! They offer so many papers and embellishments (a LOT of freebies too!) and fun little extras. The program is real easy to learn and all the elements are nicely organized. 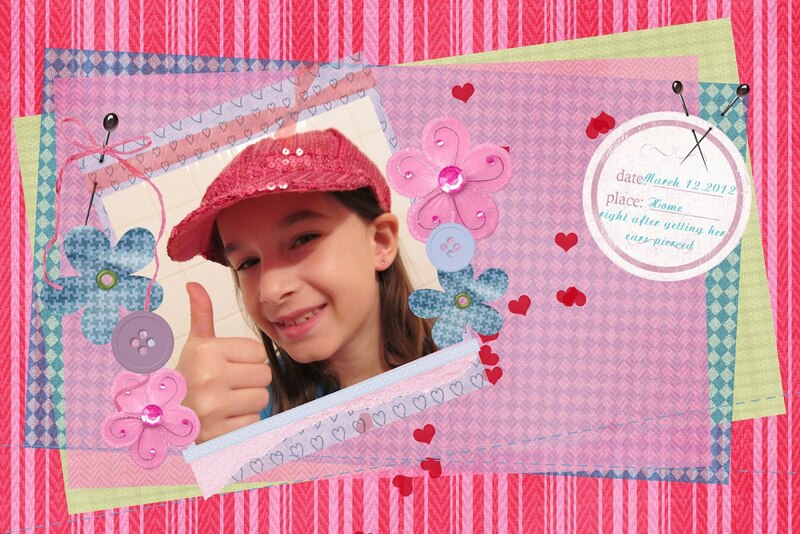 It looks like I'm happily back into scrapbooking but I see many more uses for the My Memories software! Invites, and announcements, and I am now looking forward to making my own photo Christmas cards with it this year! Thank you very much My Memories for the software!! And the best part is that they are allowing me to give away a copy of the program to one lucky reader!!! While the contest is open.... and no doubt for a long time afterwards :) I wanna share the pages and other things I've made using the program. Back in the day, when I used to do scrapbooking I would do a year per book. Yes I often had to buy extra pages! So I decided to start this with the same idea and the first "moment" that I wanted to capture this year (other than our holiday, I'll conquer that next) is my daughter FINALLY getting the nerve to pierce her ears. She's wanted to do it for months, been at the store twice and got too nervous, but this time she did it. I was so proud and the happiness in her was massive. I also made a card using their digital papers and their leaf images. One last thing. You'll find a coupon on the side here for $10 off the software price! It retails for $39.97 but make note of the special code for a $10 discount AND that code also includes $10 of additional product so it has a $20 value!! I had a peek at their site....I'm liking the Dollar Store. There's some cool stuff in there and tons of it! The My Memories web site is great - I'd never seen it before. Love the Digital scrapbooking kits - especially the Spring Easter papers. Love your card too.